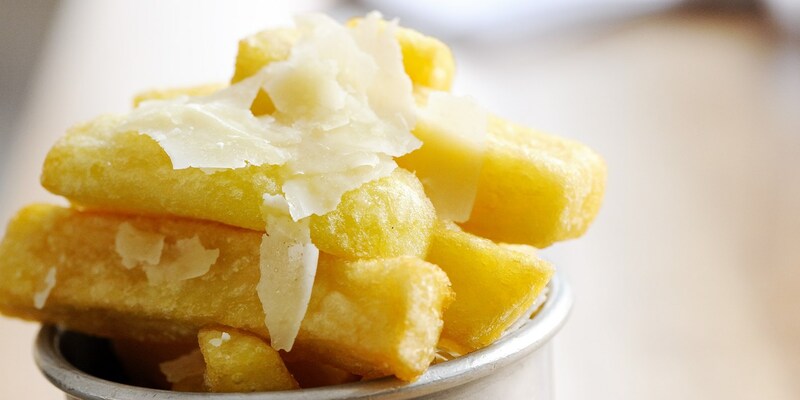 The perfect chip should be light and fluffy on the inside and crisp on the outside; triple-cooking chips is the best way of ensuring that this is the case. The perfect chip begins with the potato, Dutch Agria, Maris Piper, Fontaine and Maris Bard are all commonly used varieties. You can use any suitable oil for deep-frying the chips but some say that 70% vegetable oil and 30% rendered fat like lard or beef dripping gives the best flavour. These chips are a tasty treat on their own with a dollop of mayonnaise or you could incorporate them into a meal such as Tony Fleming’s Meantime wheat beer battered fish and chips. If you want to go all out try Shaun Rankin’s Lobster, triple-cooked chips and Béarnaise sauce.